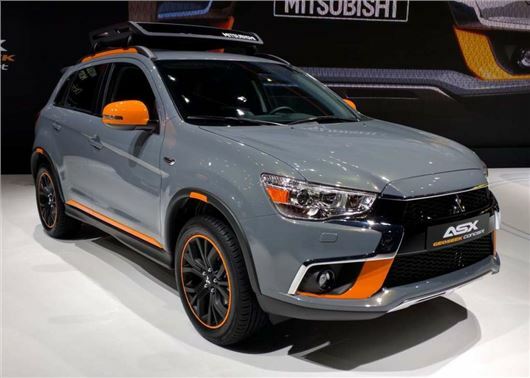 Mitsubishi has revealed the revised ASX at the Geneva Motor Show 2016. The updated crossover gets new front-end styling like that seen on the latest Outlander and will be available to order in the spring from around £16,000. Aside from the new grille design, changes are relatively minor, there is a shark-fin antenna, new 18-inch alloy wheel designs, piano black accents on the steering wheel and more supportive rear seats. There is also a new 1.6-litre diesel engine with 114PS and a six-speed manual transmission, linked to two-wheel or four-wheel drive. The show car is painted in a grey and orange combination that may or may not go into production, depending on interest. Called the Geoseek Concept, it features a few rugged extras including a chunky roof rack. Inside there are orange details on the seats, handbrake and vent surrounds. Mitsubishi has also given the same treatment to an L200 which, again, may go into production depending on interest.